You can use ExpanDrive to connect to the FTP server of your choice. The File transfer Protocol is a well-established protocol for sending data using the client/server model. With ExpanDrive, you can even secure your FTP sessions using TLS/SSL, or TLS/SSL (login only). An FTP account uses two channels to establish a connection: the control connection and the data connection. The control connection is used to send the username and password and other commands. Files are transferred over the data connection. When you use Expandrive you can choose to create a FTPS connection which encrypts the control connection (login only), or both the control and data connections (slower performance). Note: FTPS should not to be confused with SSH (SFTP) which uses the SSH protocol to exchange information securely using private/public key pairs. Click on FTP. The FTP configuration screen is displayed. username Username that you use to connect to the FTP server. password Password that you use to connect to the FTP server. The username and password are sent over the network in unencrypted form. Data is not encrypted. Both the control channel and data channel are encrypted using SSL. Only the control channel is encrypted using SSL. The data channel is unencrypted. port Port for the SFTP server. Default is port 21.
drive letter Drive letter that will be assigned to the ExpanDrive drive mapping in Windows. If “reconnect at login” is enabled, the same drive mapping is enabled each time that ExpanDrive connects to the server. The following security options are possible. 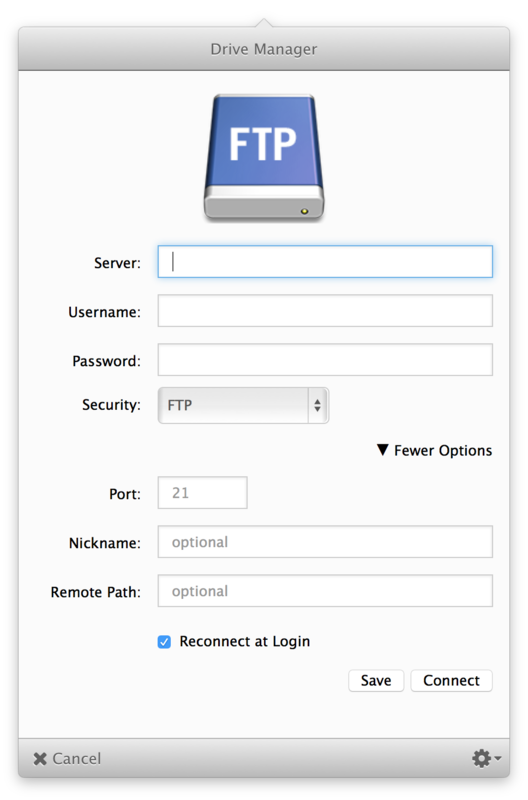 From the FTP configuration screen, enter the server name. Note: This is not a secure connection. Neither the username/password or data are encrypted. For security specify FTP with TLS/SSL. Note: This is a secure connection. Both the connection and data channels are encrypted. You may notice an impact on performance. For security specify FTP with TLS/SSL (login only). Note: This is a partially secured connection. Only the connection channel is encrypted. The data channel is left unencrypted.